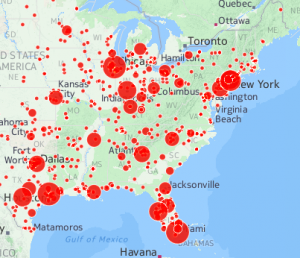 We pulled together OSHA’s weekly Fatality and Catastrophe reports from 2009-2015 and turned the numbers into a few interactive maps to help you visualize where catastrophic accidents (accidents where workers were either killed or severely injured) have been most prevalent. You can move them around and zoom in on your city. Hover over the red dots to get more information about incidents reported for each area. Keep in mind that the figures are not per capita, so they don’t tell the full story. Nevertheless, just looking at the top ten cities you can start to discern some interesting facts. For example Las Vegas is number 5 on the list, but it’s only the 31st largest city in America. That means that Las Vegas, with an actual metro population of about 600,000 actually had more accidents than Los Angeles with a metro population of almost 4 million. On the other hand New York is by far America’s largest city, but it ranks at number 4 with 42 accidents, whereas Houston, which has one fourth the population of New York, had over double the number of accidents. 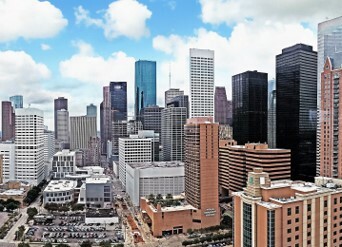 Houston tops the list of cities with the most catastrophic worker accidents. These are the most dangerous cities in the United States for workers, based on the number of OSHA cited fatal or catastrophic cases. The above map is somewhat incomplete because 1) We filtered out towns that only had 1 case, as there were thousands of these and it cluttered the map, and 2) because it doesn’t take into account the areas surrounding a city that are not within city limits but are part of the metropolitan area. That’s why we’ve included two more maps below, both of which are based on zip codes rather than city names, with nothing being filtered out. The first shows clusters which combine the total deaths in a region. The size of the clusters is effected by how far you’re zoomed in or out. The last map is a heat map, which allows you to get a better idea of where the cases are most concentrated, right down to specific zip codes. Disclosure: We offer no guarantee that our numbers are 100% accurate, as they were compiled programmatically from a massive list of over 7000 cases. However, this report does give a good general idea of which US cities are most dangerous in terms of how they compare to each other. Another thing to note is that this is based on the number of cases, not the number of total people injured or killed. Those numbers are quite a bit higher, as many of these cases injured or killed multiple people. While not all of these cases resulted in a death, the vast majority did. If you’d like some deeper insights into the data, we’re working on a new report for 2016 where we go into details like: actual number of deaths, accidents by category, accidents per per capita etc. We’ll even highlight some of the weirdest workplace accident descriptions to illustrate that you can never be too careful. Check back soon!